Akua Inks are professional-quality inks created by two printmakers, Susan Rostow and William Jung. Rostow & Jung were motivated to create safe, fume-free inks when they decided to bring a baby into their marriage and their New York City live-in studio. In the mid-nineties, Susan and William began looking for a water-based printmaking ink. They discovered that the few water-based inks available dried too quickly and were not of professional quality. At that time there was not a single water-based ink on the market that was specifically made for wiping an intaglio plate or working a monotype plate with a long open time. They recognized that there was a growing demand from artists who wanted to make high quality prints without compromising their health, so they decided to develop their own ink and ended up creating two lines of ink; Akua Intaglio® and Akua Liquid Pigment®. Today, Rostow and Jung are active New York City artists and educators. They have exhibited their artwork throughout the United States, Europe and Japan. Their works are included in numerous collections including the Library of Congress, National Print Archives. 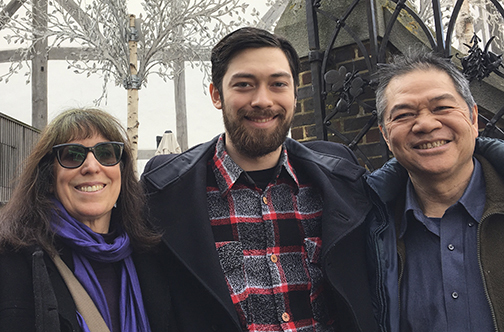 Susan Rostow received a Pollock-Krasner Foundation Award and William Jung is the recipient of the New York Foundation for the Arts Fellowship. To learn more about Susan and her work, visit www.susanrostow.com. To see a range of her artwork, visit the Akua Gallery.